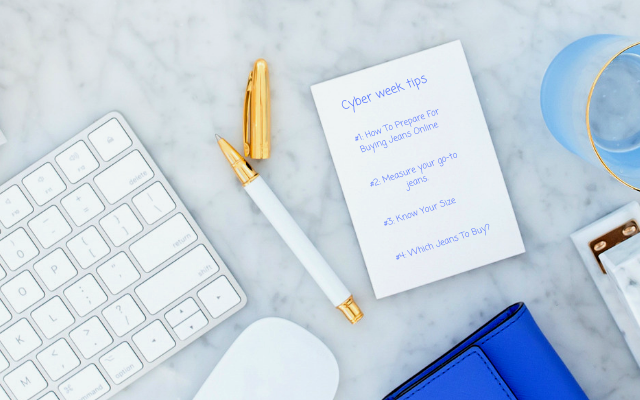 Buying jeans during Cyber Week doesn’t have to be a chore when you have a clear idea of what you are looking for. So here are my tips to keep you confident in bagging the jeans you need at the best price possible. Preparation is key and you can use this information each time you shop for jeans online. Check your wardrobe, which styles are your go-to jeans? They may be your favourite high-rise black skinny’s or your ripped boyfriend jeans, whatever they are these are the styles you should be choosing to purchase during Black Friday through to Cyber Monday sales. Buy jeans that work for your body shape or the style you’ve tried on before but felt the price was too high. Keep away from new styles as this isn’t the time for exploration. #2: Measure your go-to jeans. This will give you a blueprint for the jeans you love, to use for the jeans you want to buy. Lay your jeans down on a flat surface measure the following points – make sure you jot them down as you’ll need them later when your checking jeans online. #a: Measure the jeans front rise. this is the measurement from the top of the waistband down to the bottom of the crotch seam. #c: Take the measurement from the smallest part of your waist which is your natural waistline, above your navel and below your ribcage. Measure straight across. Note that your actual waist measurement will not equal jean waist size. For example, a person with a 26-inch waist typically wears jeans with a 28-inch waist. #d: Match the 8.5″ rise that works for you to the rise of the jeans you’re looking to buy. A 30″ leg length works well with the boots you like to wear with jeans. Make sure those new jeans have the same leg length. 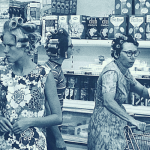 It’s not rocket science ( I know) but you can lose all rational thinking when your shopping in the Cyber Week Sale. Knowing your size before you buy is key but if you’re unsure, buy two sizes and send the one that doesn’t fit back. Be sure to check the retailer’s returns terms and conditions before you purchase. 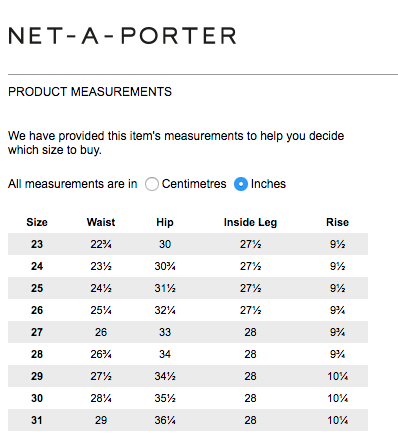 Here is a size conversion chart from Net-a-Porter that shows the equivalent of clothing sizes worldwide and jeans sizes at the bottom of the chart. Print it out and have it handy. 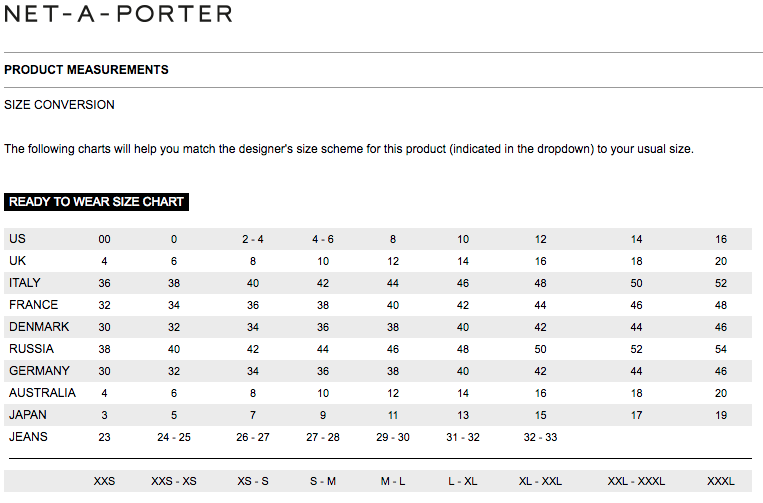 A good retailer will give a size breakdown per size of the product you are looking to buy, in both centimetres, inches and jean sizes, such as below. #4: Which Jeans To Buy? As a denim blogger/ expert, I’m looking at premium denim brands styles they call the ‘core basics’. Now, these are the key shapes that are ‘in stock throughout the year,’ it’s the colours and washes that change each season. You’ll find it’s the fashion colours that will be in the sales, rarely the colours that can cross over from seasons such as black, navy or dark indigo washes don’t make the sale. 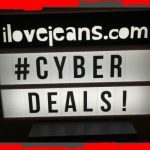 If you don’t normally spend $100+ on jeans then the Cyber Week Sales are a great time to purchase premium denim at a not so premium price! Anything in Photo Ready, or the latest fabric technology Photo Ready HD. J Brands patented fabric that lifts and contours to your body which has an exceptional recovery. Paige’s Transcend fabric merges fashion and technology to create the most comfortable jeans on the market that is unparalleled in comfort, fit and innovation. Have you checked out the Black Friday Watch page for the most up to date reductions in denim styles? 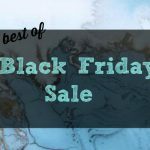 THE LATEST PRE-CYBER WEEK – BLACK FRIDAY – CYBER MONDAY DEALS ARE HERE! 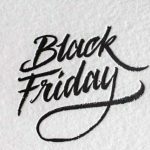 « THE LATEST PRE-CYBER WEEK – BLACK FRIDAY – CYBER MONDAY DEALS ARE HERE!